On August 27th, New York City Mayor Bill de Blasio and the NYC Office of Resilience & Recovery announced plans to spend $100 million to fortify lower Manhattan against future superstorms. The latest proposal calls for green spaces, levees, and floodwalls to protect the area from East 23rd Street to Montgomery Street, and around the northern tip of Battery Park City. This is on top of $15 million pledged in March 2015 for flood prevention in the area. To further capitalize the project, the city is leveraging its $100 million dollar investment as it enters the HUD National Disaster Resilience Competition in the hopes of gaining up to $500 million to finance flood protection in the target area. All current storm and floodwater mitigation efforts are a part of OneNYC, the city’s $20 billion global warming resiliency plan. 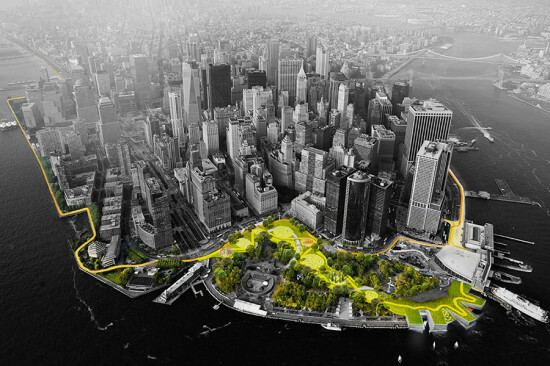 Lower Manhattan is the target area because of its vulnerability to flooding during superstorms. 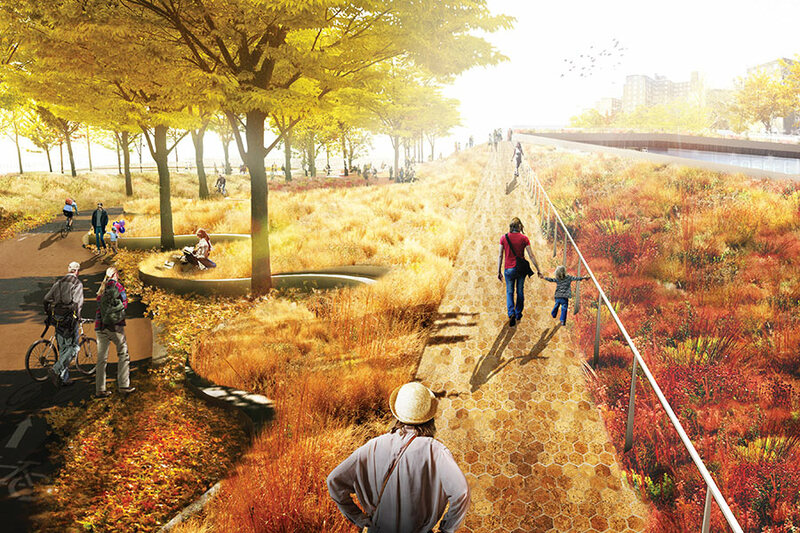 The objective is to combine flood protection with accessible parkland for the affected neighborhoods. Of special concern is the storm readiness of NYC Housing Authority (NYCHA) complexes, including the Alfred E. Smith Houses on St. James Place, which were badly damaged by Hurricane Sandy. 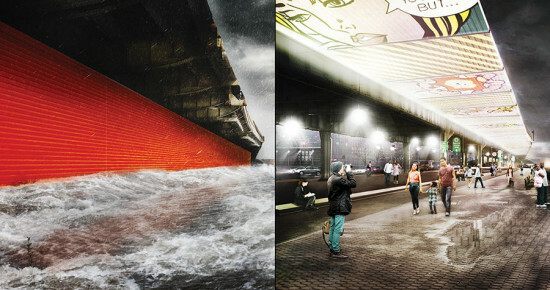 Initially,‎ a submission from the Bjarke Ingels Group (BIG) branded dually as the BIG U or the Dry Line, was selected as one of six winning projects for 2013’s Rebuild by Design competition. Sponsored by HUD, the Municipal Art Society, the Van Alen Institute, and other regional stakeholders, Rebuild by Design asked firms to envision how New York City and the region could protect itself against extreme weather. In the proposal, BIG U covered a more extensive area—from West 54th Street, to Battery Park, and up to East 40th Street—and envisioned more intensive modifications to the built environment. Rebuild by Design initially awarded $335 million to the project. The adapted plan draws on BIG U’s guiding principle of small but powerful interventions that fit the scale of the neighborhood and activates public space, but the scale of the project will be reduced to meet the city’s budget. Heather Fluit, from HUD Public Affairs, told AN that she couldn’t comment on whether BIG’s design will remain in any future project. “We’ve closed the book on that competition,” she said. The final plan will be determined by the size of the grant received from HUD. The Office of Recovery & Resiliency is preparing a round-two proposal for the Disaster Resilience Competition. HUD is expected to share grant winners and funds allocated to each of the chosen submissions by January 2016.